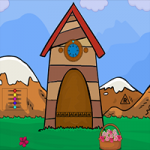 G2J Funny Bunny Rescue is another point & click escape game developed by Games2Jolly. In this game, there are some poachers hanging around in a village nearby. They just hunted down a bunny and locked the animal up in a cage. Now they are gone for hunting, and therefore its the apt time for you to rescue the bunny. You need to solve some puzzles by using the clues spread around. Best wishes in your rescue task. Good luck and have fun! yellow ball goes top centre.. bad colours again..
Yep that's a funny bunny OK. Colored buttons have colored edges. Fun game! G2J is like a bad pupil. I've explained this circle=1 and star=5 things about four times, but he refuses to understand. This time again, circle and star are side by side, meaning 1 and 5. 3) vertexes, then it's 0 and 5. You're right, helmutbuchner83, it would be correct if it would be drawn as a pentagram.